honestly, this just makes me poop my pants. this is very good, excellet work! The person I like lives in sheffield :( but I was tlkin 2 him on the fone and he has a cute acsent. 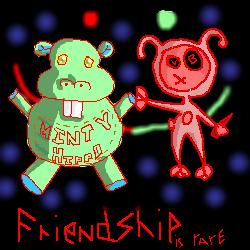 I nicked the lil friendship is rare off Ty854 ^^!! is this supposed to scare me...?